Note: Photos taken using white artificial light lamps and videos using both natural light and white artificial lights. AJ01- Fluorite with Dolomite and Calcite. Moscona mine, El Llano, Solís, Asturias, Spain. AJ02- Fluorite with Dolomite. Moscona mine, El Llano, Solís, Asturias, Spain. A group of cubic crystals with a honey yellow color, high luster and very good transparency. With white Dolomite crystals scattered through the Fluorites. The color is glossier and more saturated than usual for the Fluorites from this mine. In excellent condition. Watch the videos (natural daylight and artificial light). AJ03- Fluorite with Calcite. Moscona mine, El Llano, Solís, Asturias, Spain. 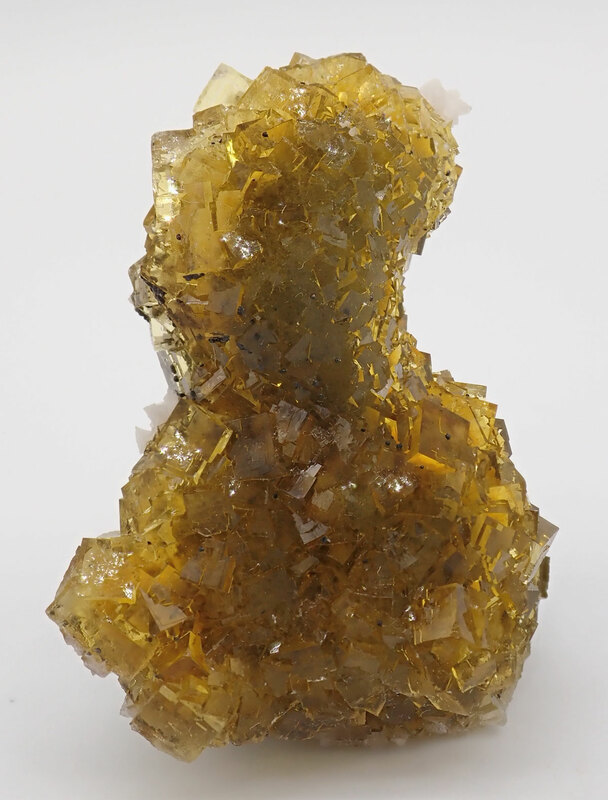 A group of cubic crystals with a nice honey yellow color, high luster and very good transparency. With transparent well formed crystals of Calcite scattered through the Fluorites. The color is brighter and more saturated than usual for the Fluorites from this mine. In good condition. Watch the videos (natural daylight and artificial light). AJ04- Fluorite with Calcite. Moscona mine, El Llano, Solís, Asturias, Spain. A group of cubic crystals with a yellow honey color, high luster and very good transparency. 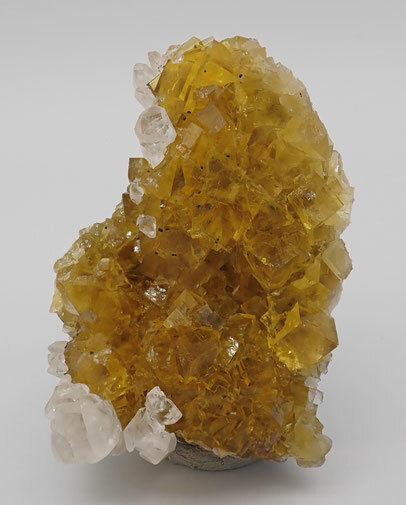 With transparent well formed crystals of Calcite scattered through the Fluorites. The color is brighter and more saturated than usual for the Fluorites from this mine. In good condition. Watch the videos (natural daylight and artificial light). AJ05- Fluorite with Calcite. Moscona mine, El Llano, Solís, Asturias, Spain. 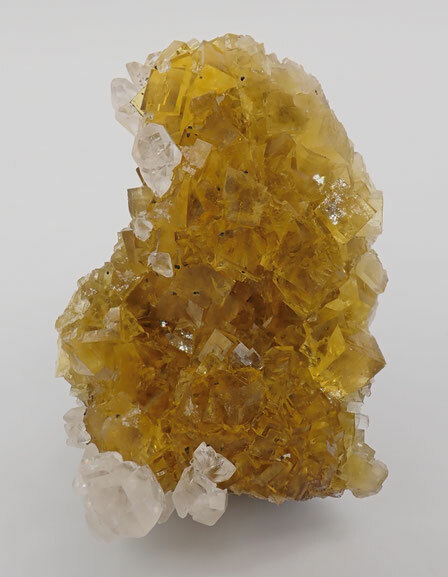 Group of cubic crystals of Fluorite with a honey yellow color, high luster and very good transparency settled on a matrix of very well formed Calcite crystals. Attractive Fluorite specimen. In excellent condition. Watch the videos (natural daylight and artificial light). AJ06 - Fluorite. La Viesca mine, La Collada, Huergo, Siero, Asturias, Spain. AJ07 - Fluorite. La Viesca mine, La Collada, Huergo, Siero, Asturias, Spain. Excellent Fluorite specimen composed of a group of crystals with deep and satured violet and blue colors, according to the light conditions, and geometrical color zoning on the bevels. Accompanied by small crystals of Quartz. A fine Fluorite from the famous La Viesca mine. In excellent condition. Watch the videos (natural daylight and artificial light). Notice the color of these Fluorites varies depending on the type of light. AJ08 - Fluorite. Diana Maria mine, Rogerley Quarry, Frosterley, Durham, United Kingdom. Group of cubic crystals of Fluorite with the typical interpenetration twins. The crystals have a very good transparency, an intense and deep green color changing to a satured violet color when passing to the sunlight. The crystals also show a strong fluorescence under UV light. From an English classic locality. In very good condition. Watch the videos (natural daylight and artificial light). Notice the colors of these Fluorites change depending on the type of light. AJ09 - Topaz. San Luis de La Paz, Guanajuato, Mexico. Nice terminated crystals of Topaz with a very good transparency, lustrous faces and nice cognac color. The crystals are partially intergrown with grey Rhyolite matrix. From a less known Mexican locality. These Topazs look so much like the samples from Utah. In excellent condition. No damage. Watch the videos (natural daylight and artificial light). AJ10 - Topaz. San Luis de La Paz, Guanajuato, Mexico. Nice terminated crystals of Topaz in parallel growth with a very good transparency, lustrous faces and nice cognac color. The crystals are partially intergrown with grey Rhyolite matrix. From a less known Mexican locality. These Topazs look so much like the samples from Utah. In excellent condition. No damage. Watch the videos taken with diferent conditions of light. AJ11 - Kobyashevite, Calcite and Gypsum. Ojuela mine, Mapimi, Durango, Mexico. Very unusual and showy specimen of rare blue-green Kobyashevite combined with Gypsum and overgrowing Calcite crystals. Nice piece. From a new find at Mapimí, not much was found. 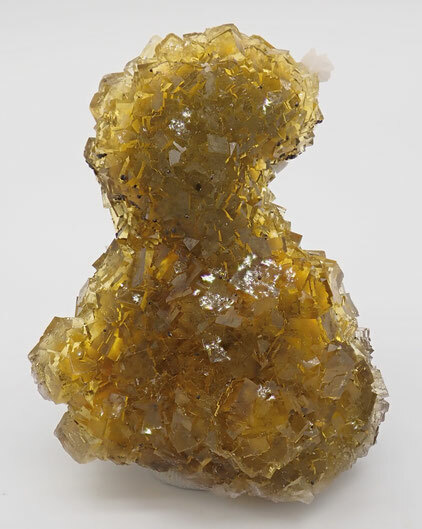 Kobyashevite is a rare copper mineral. No damage. Watch the videos taken using different light conditions. Specimen size: 6 cm x 6 cm. AJ12- Calcite with Hemimorphite. Ojuela mine, Mapimí, Durango, Mexico. 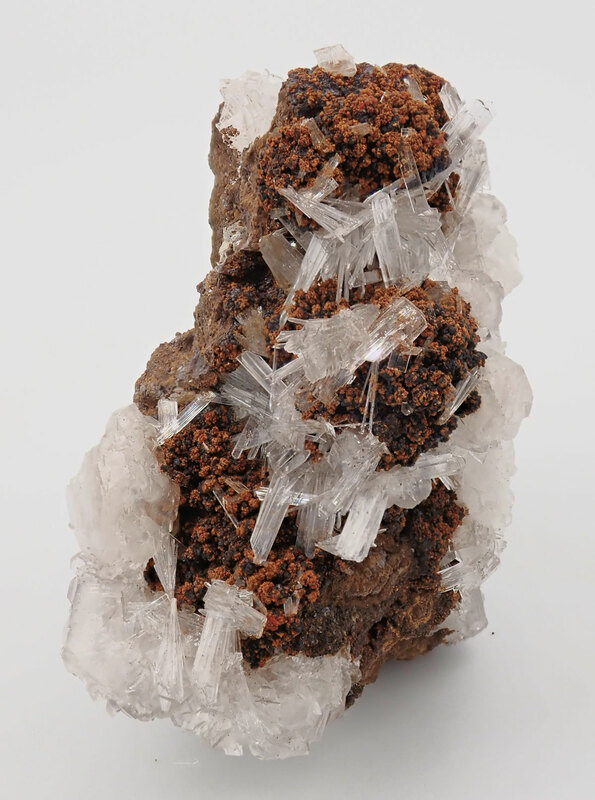 Nice specimen composed of well formed crystals of Calcite with lustrous crystals of Hemimorphite. 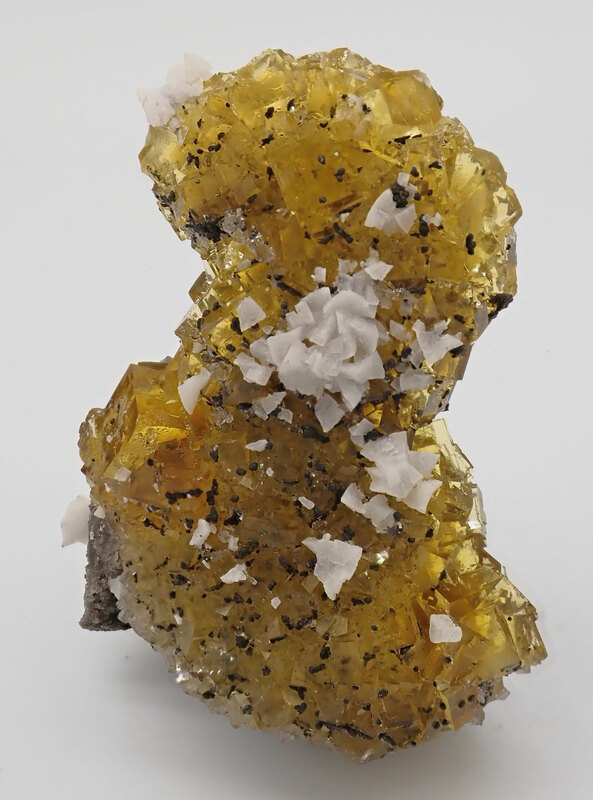 On a matrix of Limonite. 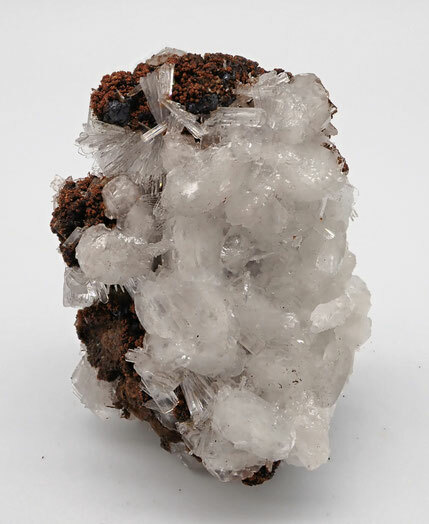 Aesthetic mineral specimen in good condition. Watch the videos. AJ13- Calcite with Hemimorphite. Ojuela mine, Mapimí, Durango, Mexico. 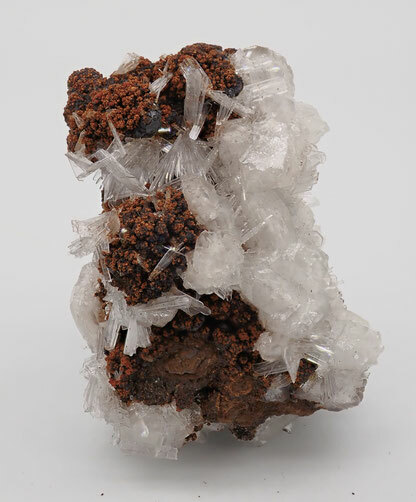 Very nice specimen composed of lustrous crystals of Hemimorphite with Calcite. 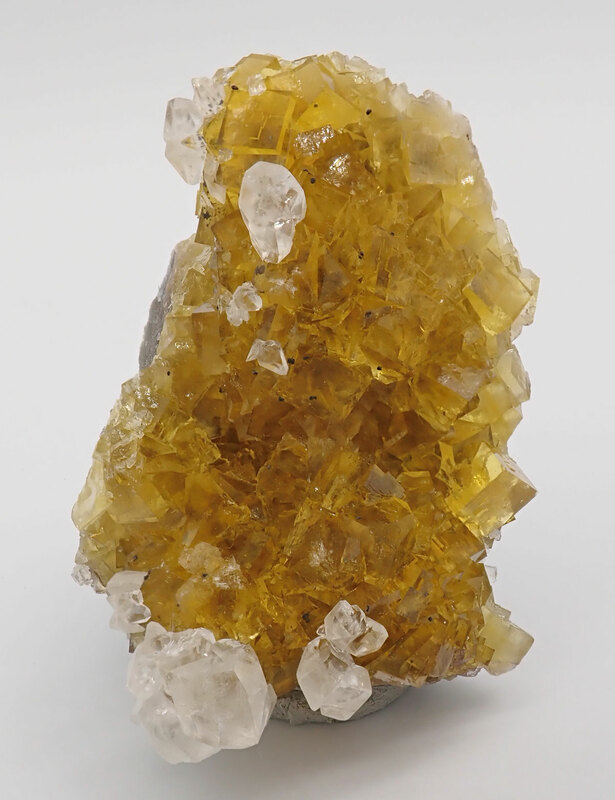 On a matrix of Limonite. 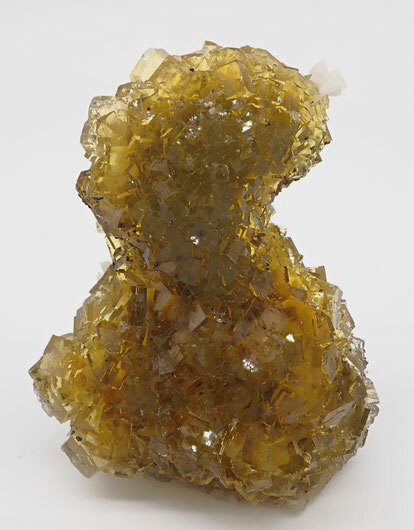 Aesthetic mineral specimen in very good condition. Watch the videos. AJ14- Zircon. Store Kufjord, Seiland Island, Alta, Finnmark, Norway. Sharp lustrous crystal of Zircon disposed on a matrix of shiny Biotite coming from an old find in Seiland Island. Norway is well-known for its Zircon specimens and this one is a classic specimen upholds the tradition of quality. Some contacts present but don´t detract from the quality of the piece. Watch the videos taken in different conditions of light. Specimen size: 3.5 cm x 3 cm.